In a moment they will never forget, 150 drum corps members joined the ranks of those who can call themselves World Champions Saturday. 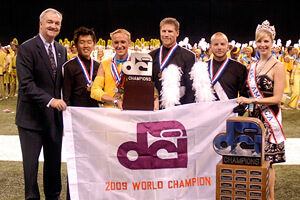 With a score of 99.05, just a tenth of a point shy of the all-time record, the Blue Devils were named Drum Corps International's 2009 World Class World Champions after completing an entirely undefeated season. Their success mirrored that of their Open Class counterparts, Blue Devils B, who earned the gold medal in the Open Class Finals competition earlier in the day after their own perfect season. The optimism and excitement of "1930" shined through the Blue Devils' last performance, which earned them the right to proudly wear the Champion medals around their necks and call themselves the "best of the best" in marching music. "Ninety-nine is a great score…we'll take that," said Blue Devils Executive Director David Gibbs on the win. "I'm kind of out of words. It's indescribable. People do not recognize how good these kids are – not just in talent but as human beings. They just don't know that these kids are so special, they've worked so hard and sacrificed so much – and I want to tell them I'm extremely proud of them." The Blue Devils took top honors in every caption Saturday except for Brass, which they conceded to Carolina Crown. In addition to the corps' overall perfect season, which happened last in 1994, the Devils' percussion was also undefeated in caption scores throughout the season. "We were undefeated. We haven't used that 'u' word all season because of karma. We can now say it," said Scott Johnson, Blue Devils percussion caption head and arranger. "The last undefeated drum line was 1974, Santa Clara Vanguard. So for the drum corps to go undefeated and the percussion section to go undefeated … I'm just numb! Damn those kids were consistent every day. Every single day they were consistent." Though the Blue Devils held on to the top spot the entire season, the fierce competition from other corps kept them on their toes, something Blue Devils drum major Brian Howard couldn't deny even in his moment of World Championship glory. "Undefeated season … it's the best thing we could have asked for. Great audience, this was a great show. They went crazy for us tonight," said Howard. "The competition was hard and tough. It was not an easy thing, it was a hard summer. So many great drum corps out there tonight. Crown: amazing job. Cadets: great show, amazing corps. Seventy-five years they've been out here, but another great night for us too. I'm speechless. This was amazing." The silver medal went to Carolina Crown with a 97.50, representing the highest finish and score Crown has ever seen and the first time they have medaled in their history. They captured the Brass caption award as well as the Fan Network Fan Choice award, which gave fans a voice in choosing the top corps in their eyes. "We're obviously very excited; it's a huge step for our organization and for the performers. We had a great show so it didn't matter where we came out—we were all just happy with our show," said Crown drum major Blake Daughtrey. "We have been performing well all season and it came down to the end and we performed at our highest. We ended with our best show of the year, which is how we wanted it to go." Drum major Mark Whitfield added that the corps members accomplished their main goal on Saturday. "Really our biggest thing all summer has been chasing and living up to our standards. Our biggest goal has been a perfect performance; making a CD that everyone wanted to listen to … I think we accomplished that tonight." The Holy Name Cadets finished up their 75th anniversary season in third place, earning a 97.20 and the bronze medal. Cadets drum major Ben Pouncey said the whole season was "indescribable" for the corps. "To look back now at how far this corps has come, it's hard to describe the emotions really. It's been a huge honor to be a part of this corps, and it's a privilege to stand in front of this group every day. Really right now we're just ready to celebrate a great season. We had a great time, a great show, and we're just truly honored." In the only upset compared to the Semifinal results, the Blue Stars (90.05) overtook Phantom Regiment for eighth place. Veteran tenor drummer Dan Kelly said the progress made by the organization in his four-year tenure with the Stars has been an exciting climb into the upper ranks of the World Class. "For the past four years, the organization has continued to get better and better. It's neat seeing the audition camps go from 20 people trying out for snare to there being 40 and then 100 and more. Just seeing the quality improve has been amazing." Luke Babb, a Phantom Regiment color guard member, said he had a great summer with the Regiment, who took ninth place with an 89.90. "It's been an amazing experience to march for a corps like the Phantom Regiment. These people I've marched with are amazing. They are so talented," he said. "What made the summer special was getting to meet 35 other guard people who have the same passion as me; who are trying to reach the same goal." Phantom Regiment Executive Director Rick Valenzuela said one thing that sets his corps apart is that they know how to finish the season on their own terms. "No matter what the judges say, what we do is for the fans," he said. "The people that buy our T-shirts, the people that want to be entertained and be happy, be sad, cry, laugh and dance. It's what we do. I told our members, our job is to entertain the people, and they did that tonight. For whatever faults people see in the show, it still did its job, which is to make sure the fans had a great time." Number crunching fans may be quick to point out that this year's fourth place finish (96.150) for the Cavaliers is the first in nearly a decade the corps was unable to medal at the Finals, but Cavaliers Director Bruno Zuccala said despite that statistic, the corps had a phenomenal season and an amazing final performance. "Our standard is that the guys should feel really fulfilled with what they've done and what they've accomplished. So no matter what the outcome is, they're very, very excited about their performance. And that's all we could ask for." First-year snare drummer Spencer Murray said his season with the Cavaliers was the best experience of his life. "I really couldn't have asked for a better summer," he said. Santa Clara Vanguard (95.65) finished in fifth place with a program fans were buzzing about all season. "The Vanguard Cadets and the 'A' corps' productions were both very fan friendly and had a lot of depth to them. As people saw them more and more, the show grew in their eyes," said Vanguard CEO Jeff Fiedler. "Everybody is very happy with the results of both the Vanguard corps. This summer had a really positive vibe and I think we're going to be able to build on that for the next couple of years to push the organization ahead in the standings and in how people feel about the corps." Moving forward, Fiedler said, "We're going to be all about the music. Our visual package is always going to support and enhance what's going on with the music, but the music in going to be our first priority." The Bluecoats rounded out the top half of the competition, ending up in sixth place with a score of 93.15. First-year bass drummer Caleb Gasteiger described his summer with the Bluecoats as "tremendous." "It wasn't just the camaraderie that I had with the friends that I made and the people I got to meet in the corps. The performance aspect was amazing. We worked together so well and I don't think there was another line that was as close as we were." Tom Spataro, executive director of the Boston Crusaders (7th, 90.70), said his corps far exceeded the staff's expectations. "You always want your last show to be your best and I think if you're able to achieve that, it's been a really, really great night. It's obviously a really emotional night too, and everybody is happy and sad. They really brought it," he said. "We know that this was the very last performance of the 2009 Boston Crusaders, so it's always emotional." Tenth place went to the Glassmen, who earned an 87.75 at the end of their "Journey of One." "It was absolutely incredible; the performance of my life. We threw everything out there and it was so much fun," said Mark Ziegler, a fifth-year trumpet player with the corps. "What I'll remember the most from the season are the people around me. They mean more to me than anything and I'm just blessed to be around them." The Blue Knights brought the cold of Colorado to Indianapolis for the last time Saturday, earning 11th place with an 86.45. Horn sergeant Josh Schweitzer marched in his sixth season with the Blue Knights this year with two of his brothers by his side. "I just tried to give all the emotion I possibly could until the very end," he said about the performance. "It's just amazing stepping out on the field knowing that it's your last performance after six years of marching. It's hard knowing that last performance was it. I loved it."